Emerald Isle, N.C. (October 16, 2018) – Transportation Impact (TI) announced today it will serve as the primary sponsor of the No. 43 Chevrolet Camaro ZL1 driven by Bubba Wallace at the Kansas Speedway this Sunday. 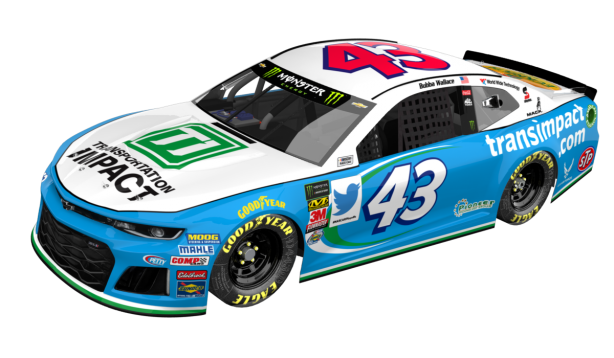 The parcel spend management firm, headquartered on the Crystal Coast, will increase its associate sponsorship of Richard Petty Motorsports (RPM) to be the primary sponsor of Wallace Jr. and the No. 43 team during the Hollywood Casino 400. TI is one of the fastest-growing companies in North Carolina, having experienced robust growth since its 2008 founding, by helping high-volume parcel shippers reduce cost through innovative audit and negotiation services. These services, along with the company’s industry-leading technology, enable businesses large and small to identify and obtain savings they can then use to fund new initiatives, retain employees, or hire new ones. TI co-founders, Travis Burt and Keith Byrd, appreciate the partnership, both from a business perspective as well as a personal one. The association between Transportation Impact and RPM began in 2015 and has developed into a strong connection that goes beyond business. The Hollywood Casino race will air Sunday, October 21, at 2 p.m. ET on NBC. About Transportation Impact Transportation Impact, a 6-time Inc. 5000 honoree, leverages proprietary technology unique to the industry that ensures our customers pay the lowest possible small parcel and LTL rates. In addition to saving an average of 15% or more, shippers benefit from our best-in-class TMS, which enables them to optimize their daily shipment routing decisions. Along with the Inc. 5000, TI has placed three times in the North Carolina Top 100 and North Carolina Fast 40, and earned Business NC Top Employer, Inc. Best Workplaces, BBB Torch Award, CAI Ovation Award for Corporate Social Responsibility, and Parcel Hot Company. For more information, visit https://transportationimpact.com/.